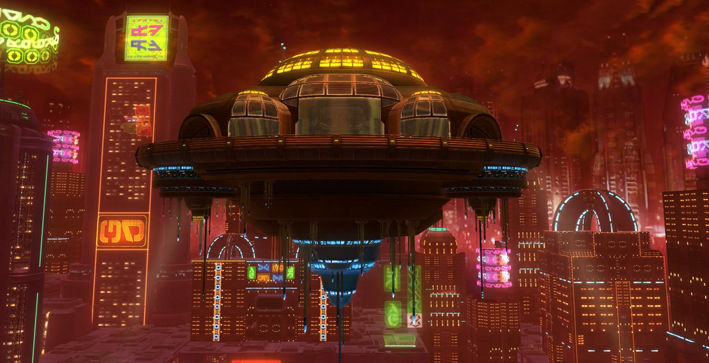 The Dancer’s Palace was a floating haven in the skyline of Nar Shaddaa, but it was engulfed in flames and swallowed by smoke. The west end of the Palace had already broken apart and fallen to the city below. It was only a matter of time before the rest would crumble. Ke’rii stood on the balcony and felt the stronghold shudder beneath him. His skin was shimmering with a combination of sweat and blood as his cerulean eyes flashed about the balcony. They were lined up dead. Keiko’li at his feet, her lifeless gaze staring up at him. The pool of her blood seeped around her, spilling around his own feet. Next to her was his sister, Mei’li. Her lightsabers disengaged by her hands. She was face down, her body covered in blood. Then there was Alara leaned up against the crumbling structure. Her blaster lying limp in her hand. Her eyes were open and shifted slightly towards him as he looked at her, but she remained lifeless. Scattered next was Tutix and his uncle Gung’chul. A vibroblade stuck out of the elder man’s body, having penetrated his Republic armor. Then his own mother, Sihnon… it was an endless trail that led him back inside, and he followed it. He felt the souls of the dead following him, reaching out for him, accusing him. Keiko, Mei, Lara, Tut, Gung, his mother, Kaatulf… even his sister, Xia’li. What the kriff was she doing here? He felt frantic and again the Palace shuddered. He ran inside and found Sol’ange dead. Moff Heermann, his white clad uniformed stained with his own blood. Wheelie a pile of rubble. Mr. Hat, as lifeless as Karmic lying next to him. Bodies of the usual patrons sprawled out across the ground and up the staircase, leading him up… and up… and up… Milo, a group of jawas… all dead… all leading up the endless staircase. The walls… he looked at the walls, at the pictures hanging… The Shengli in flames. The Oasis Lounge flattened into dust and debris. The Kol Darin Shipyard torn apart, the lifeless bodies of the Advozse floating in space. The Ziost Avenger, abandoned and lifeless. His childhood home on Naboo, destroyed. The Lazy Luck Cantina, demolished. Fort Marr crumbled and crippled. He couldn’t take it anymore and ran up the stairs. He would run until he found something. “Help me,” whispered the voice of his niece, Sartori’li. He looked up and saw the little pureblood child reaching out for him. Her skin was grey, sickly and her eyes were glazed over by the taunt of death. “Help me, uncle Ke-ke...” the child begged again. Behind her, the Force entity of his father, Hoban’ji, looked down at him. Disappointment. “You killed them all,” his father said and reached out towards him with his hand. “Take responsibility…” his voice seemed to fade. “Daddy!” Keiko’s frightened cry seemed to echo above the rest. Again, the Palace crumbled and he looked up. The ceiling was gone and the Blood Hound was hovering above them. A blaster fired, and Ke’rii looked to the top of the staircase, and found Bloodthirst. “I wanna taste your blood fresh as I kill you…” the pirate’s face was covered in Ke’s blood and he looked down at his prey with crazed eyes. ...and he woke with a cry and sat up in bed. Goosebumps dotted his skin and he was covered in sweat. He tried to catch his breath as he looked down at his bare chest. He hadn’t been run through, but kriffin’ hell it sure felt real. He looked over at Keiko and saw she was still sound asleep. They were still on Nar Shaddaa. The Dancer’s Palace was still a safe haven, and he for the moment, he was still somewhat safe. Ke’rii ran a hand slowly through his raven hair and knew he wouldn’t be sleeping much, if at all, tonight. He fell back into his bed and stared at the ceiling. The colorful night lights of Nar Shaddaa danced shadows above him and his muscles started to relax. Ke’rii felt as if he had just fallen back asleep when he heard glass shatter to the ground just outside his room. He sat up quick, and heard Wheelie let out a surprised series of beeps and whoops. “Gah!” he cried as he stepped on broken glass. “Kriffin’, son-of-a,” he stifled his words so Keiko wouldn’t wake up. Carefully he lifted his foot from the ground and removed a small shard of glass. Wheelie beeped at him and that’s when Ke noticed the little astromech was tangled in a tripwire. A tripwire. A kriffin’ tripwire? Then he remembered the tripwire. With a curse, he got to his feet and remembered to holster his blaster before rounding the corner into the palace itself. He advanced warily, well aware that if the tripwire had been discovered this could be a trap. Not that any weapons or hostility would get one far in the Dancer's Palace before the stasis fields kicked in, but caution never hurt anyone and he'd rather be paranoid and alive than carefree and dead. So as he edged up to the corner of Ke'rii's room, he doffed his hat and peered around. No Ke'rii in sight... Just a shattered glass, and a very excitable droid that was racing around. With a sigh, he put his hat back on snugly. He should have expected that a serving droid or whatever that thing was would set it off. Typical, just typical. As the droid whistled and beeped in protest, he checked his wrist-mounted chrono for the time. The eighty-first hour, Nar Shaddaa time. The sun wouldn't be hitting this portion of the planet for another six hours. With a stifled yawn, he was wondering if he could get some sleep in before then when he was stopped by the soft whoosh of an opening door. Making sure that his hat and rebreather were properly obscuring his face, Gharzog stepped around the corner, revealing himself. Ke'rii was barefoot and shirtless; he'd probably just woken up, but he did have a blaster in his hands. "Decided to give 'yerself in already, 'ey?" Gharzog asked, leaning casually against the wall. He didn't really expect that, but he was trying to keep his cool while repeating to himself that the Dancer's Palace security was still working as it had for the past several years and that he was not about to get shot. Ke'rii finished untangling Wheelie from the tripwire, and glanced over his shoulder when he heard Mr. Hat speak. His hand tensed on his blaster, but he knew he wasn't quick enough to bypass the security put in place and he certainly wasn't about to get caught in a stasis field. One: that would be disrespectful; and two: it would be downright embarrassing. “All free, little buddy,” he said calmly, returning his attention to the astromech. Wheelie chirped a thankful beep and rolled off into the next room to do whatever it was he needed to do at this late hour. Ke watched the droid until he disappeared before rising to his feet and looking back to his new shadow. He adjusted his stance so not to leave blood tracks on the floor from the fresh cut on his foot. “Tripwire, huh?” he chuckled with amusement as he observed the other. The new rancor in the room was his blaster. He hadn't had it earlier that night, but now, here it was. And he knew the other saw it. He grinned as if he just got caught trying something he shouldn't. That satirical look of ‘ye got me’ amusingly shown in his face. He lowered his blaster to his side, and eyed the man's armour. What tricks and gadgets did he have that were just waiting to be used on him? From his armor to behind Mr. Hat, his eyes moved subtly, observing where he had come from. Of course he perched himself out front, that was the most accessible way in or out of this joint. Gharzog, still leaning against the wall, watched Ke'rii untangle the droid before he stood up and remained silent as he spoke throughout the time, instead keeping his eyes on the blaster. It was a pity that he couldn't take a picture in here, since a person could tell a lot about someone by the kind of weapon they carried. He'd try to remember the shape and details, it could lead him to further information. As the captain lowered it by his side, Gharzog again returned his attention back to the man's face. He looked young, but not too young. Middle-aged was his guess. Untidy unkempt hair. A scar across one eye. But most importantly, cybernetics. He always hated dealing with those that had been cybernetically enhanced. They could have all sorts of dirty tricks. One bounty that Gharzog had pursued had gotten his eyes modified so that he could shoot blaster bolts out of them. Another had astounding strength by replacing his arms and legs. No telling what Ke'rii had been able to afford, but he was willing to bet that there was at least some sort of Holonet connection or communication upgrade, that was generally standard practice. As Ke'rii mentioned breakfast, Gharzog flicked his eye back down to his blaster just to remember where it was, before looking back up at the grinning captain. "I prefer lunch 'meself. Breakfast is usually too early 'round 'ere." Gharzog replied dryly, before gesturing towards the tripwire with a gloved hand. "Got to keep 'ye on 'yer toes, and electronic measures don't work too well in 'ere. The fancy security system they got which prevents us from shootin' each other also messes with cameras, bugs, and spectrums of light like a laser tripwire, 'ey?" He explained, though 'somehow' failing to mention that bug sweeps actually only happened every twenty-four hours - Roughly three times in Nar Shaddaa's eighty-seven hour cycle. Ke'rii didn't need to know that there was a time where he could be bugged. "Course, if 'ye really want breakfast that badly, I know 'meself a diner down in the Corellian district that serves some nice fried roba bacon and nuna eggs. I"ll buy... But it's outside." Ke’rii grinned as the hunter tried to entice him outside by talk of food. And the Corellian district had plenty good diners. He started to recall one time he and Alara took a get-away trip to the Smuggler’s Moon when they were both still serving the Republic Military. Man, that was a good time. Being that the woman was from Corellia, she knew all the good stops. He started nodding fondling at the memories and a silly grin came across his face. He caught himself and looked back to the Mr. Hat. “Mmm…” he nodded. “You place a good bargain. I do love some good fried roba bacon. Mmm-mm,” he hummed. “Can’t tell you how good that sounds right now compared to the slop they fed us on…” he stopped himself and grinned, laughed a little. “Forget it, you probably already know I serve with the Imperial military. So yeah, sounds mighty good to me to go out for some fried roba bacon and nuna eggs. And decent cup of coffee… course, they don’t make a good caf like I do. Kriff! Once this blows over, you should come on over to my cantina and I’ll hook you up with the best brew you ever had,” wow he could talk about food, he thought. Perhaps he really was deprived of a decent meal. “So yeah,” he grinned and started walking towards the hunter and the exit. “Let’s go to this diner and… oh! Oh, oh, ooh…” he shook his head and grinned. “Only problem is… I’m sure it’s ‘no shirt, no shoes, no service’,” he chuckled and looked down at himself. “And well…” he looked back up. “Oh, and it’s outside. Think they deliver?" he tilted his head, as if he were serious. "Or I guess I’ll just have to stay right here,” he gave him a lopsided grin. Was he actually having fun with this? He stepped back in the direction of his room and pointed to the hunter. Ke'rii seemed to like the idea of that, judging on his reaction. Perhaps if Gharzog went on, the captain would start salivating. A thought suddenly struck him; perhaps he could starve him out? No, tampering with them would get him thrown out since Karmic and Sol'ange would probably not approve. Plus it seemed a rather cruel thing to do, even given an eight million bounty on the man's head. A different approach would be required if he was to get this captain to come out and expose himself. Perhaps poison? Some sort of debilitating toxin that would impair his judgement and ability? Possible. He'd have to investigate that in future. As it was, Gharzog only watched as the captain retreated back towards his room and decided to reserve further comment. There'd be time for further verbal repertoire when he held the upper hand, but for now it was a stalemate. Ke'rii wasn't leaving, but neither was Gharzog. He'd definitely need to look into poison. Or maybe Ke'rii could be enticed to leave... Maybe he could get one of his contacts involved to try and find that jawa. If the captain cared enough for it to trust it with his ship, then he should care enough for it to come running to rescue it. Then Gharzog would have his chance. So as Ke'rii went his way, Gharzog turned on his boot and made for the entrance to return to his watch. But he wasn't losing this bounty, one way or another. Ke'rii would disappear into his room, and remain there for the duration of the night. There was no use depriving either one of them a good night's rest. Tomorrow would come, and Ke had no intention on leaving the Palace. He was stalling, after all. It was only a matter of time until the Empire came down on the Crimson Dread. He just had to stay put until then. The next morning came, and Ke woke before the sun had fully risen over the horizon, and before the scheduled “wake up call” he had requested from Wheelie. He slid the door open and hoped the silent swoosh wasn't enough to wake his new shadow… wherever he might be lurking. The Imperial Captain had years of training in soft, catlike steps. He had worked for Imperial Intelligence, the SIS, and, more importantly, himself. So why not test Mr. Hat and see how possible it was for him to go about unnoticed. Ke'rii Ogasawara had a reputation of being cocky, but most of that was just his flyboy exterior. At his core, he was a professional, especially when his life was in the line. He helped himself behind the bar, brewing his own cup of coffee, which he made sure to leave credits for. It was quiet at the Palace, which was rare, and he kind of liked it. Keiko surprised him as she entered. No doubt Mr. Hat would be aware they were out and about now. The young lady didn't have the experience of her father. She fell into the chair next to her dad and yawned. “If you're still tired, why don't you go back to sleep?” Ke asked. “Cuz I know you're up and I know that hunter is still around,” Keiko replied, taking the rest of her father's caf. Keiko sighed and remained silent as she looked at her father's plate. Ke noticed and slid it over to her as he rose from his seat. “Where’re you going?” his daughter asked. “Not far,” he grinned and went down the few steps to the jukebox. The sun was just starting to touch the Palace, and certainly that meant his new friend would need a wake up call…. if he weren't awake already. Ke'rii cranked up the volume and went out onto the dance floor. Keiko stared in disbelief. Seriously, how was he so calm? The Imperial captain knew his way around the dance floor and knew how to feel music. He even aang quietly with the song. “C'mon Keiko. Dance off!” he pointed at her and had a lopsided grin on his face. “It's good cardio!” he called to her and laughed as he whirled around. His steps hit every best of music. It was clear he loved to dance and he loved music. He fell silent as he listened to the other end of the call. His smile disappeared and Keiko turned to watch him. “Nothing at all?” he sounded concerned. “Uh, well…” he ran a hand through his hair. “Last I heard they ambushed the Kol Darin Shipyard out by Riflor.” he fell silent and nodded as he listened. “Mhm. Yeah. I think they are trying to take out anyone who might…” nodded again. “Yeah, exactly.” Another pause. “Yeah, yeah. Of course. I’ve for a man out there takin’ care of her for me. Pretty good at what he does, former military, you know... so he's been updating me when he can. I'll let you know. This is your direct extension?” he nodded as the other spoke. “You got it. Appreciate it,” he tapped his cybernetic to end the call. Keiko was watching him and he gave her a smile but she knew something was wrong. “Nothing,” he lied and turned up the volume again. “C’mon, dance with your old man.” he started dancing as he came up the stairs towards her. “I don't dance, dad,” it was still too earlier for how awake her father was. But he pulled her up from her chair and twirled her. She tried not to smile as she stretched out her own arm before twirling back towards him. “I'm eating the rest of your breakfast,” she said, trying to make it come off as if she thought her father was the lamest person in the galaxy. Gharzog watched Ke'rii disappear into his rooms with a frown tugging at his lips. It was going to be much longer before his bounty was willing to turn himself in, and that time meant that another hunter could catch up to him or Ke'rii could use that time to figure out an escape route from his lavish prison. No, he needed to end this, the sooner the better. It was time he got into touch with Gordoba the Hutt. He'd promised Karmic that he wouldn't get the Hutts involved, and he wouldn't, but he just needed a few things from him, a few... Items that would hopefully make this job easier if he could put them to effect. So as Ke'rii went off his way, Gharzog returned back outside to Dancer's Palace's dock, before pulling out his holocommunicator. He hated asking the Hutt for anything as he'd surely pay for it one way or another in the end but even he grudgingly admitted that Gordoba had access to a vast network of contacts that all brought their own skills and connections to the bargaining table. It was perhaps the only thing that prevented Gharzog from shooting him. So after bracing himself, he input the connection code and waited patiently. Sometimes he had to wait ten minutes at the Hutt's leisure. Fortunately, after only several minutes of waiting time, Gordoba appeared. He looked like most Hutts... Fat, slug-like, slimy, and generally unpleasant. For his looks though, he smelled even worse, so Gharzog was happy they weren't meeting in person. "Kava baa mah chawaheke votetka?" Gordoba rumbled with a chuckle. "Skip the pleasantries, Gordoba. I know 'ye got at least seven other 'favourite' hunters." Gharzog returned. "Yanee bmeheka peee vee, Gharzog. Haku cheesba woy che uba?" Gordoba replied, chuckling again. "You can help by getting me Quesh Venom, Gordoba. In a toxin form. No cheapin' out on me either, it had better be Venenit queshaaga and not Venenit shadaaga, I know the difference, 'ey?" He explained, gesturing warningly. "Uba nanka mi, Gharzog... Fa baa meeto toe doth kiukapath pionpoe. Huntodon." Came the Hutt's return offer without even a second's hesitation. "Five thousand, because 'ye still owe me for that job in offin' Lenii." He countered. "Eniki. K'wanna don keemon dokwacha. Um ata heoi pee Jee bacaka uba, Gharzog." Gordoba replied after a moment's consideration, probably weighing up the price in his head. "Have it delivered to Dancer's Palace, and not late, 'ye got that?" Gharzog instructed, knowing that a question would be coming in response to the address. "Sonla baa Bunko? Haku doth uba woy heee, Gharzog? Jeejee cha banag bai miena tee yanee cay bu chamy." Gordoba asked, instantly suspicious. "Nothing that concerns 'ye or the owner 'ere. And 'ye keep that tidbit to 'yerself, Gordoba, otherwise the Cartel's goin' to find out that 'ye got a side business of trafficking Evocii to Imperial construction projects." He replied, threatening the Hutt. Dangerous perhaps, but it wasn't the first time and most Hutts understood blackmail and secrets as good business practice. "Ahu. Nobata dayan bai yoieu momeu. kuna kee yoieu mee copola doube." Gordoba hastily replied. "Good." He returned, before closing the channel. Satisfied that he'd receive it, Gharzog made for the comfortable little nook he'd been sleeping in before to try and get some sleep in before morning. Gharzog awoke to the sound of footsteps. Rather than jumping awake and creating a loud noise, he listened carefully. There was a whoosh of a door, and the patter of footsteps. Not boots, so whoever was walking was either barefoot or wearing light footwear. A pause, then the footsteps continued in heading away from the front entrance. If Gharzog had to make a guess, he'd say it was Keiko, the bounty's daughter. She wasn't the target, but he'd best find out where she was going. So he quietly got to his feet and made his way down into the lobby before making his way over to Ke'rii's room door and peering in through the tinted glass. He didn't see any movement inside which could be that he was still asleep, or gone. Satisfied, he carried on towards the stairwell on light feet and with his body level low to the ground. Only his coat softly rustled against the ground as he made his way downstairs and checked the main balcony. On finding no-one, he headed through the massive dining room, down the steps, and into the games room. Nothing. A bit early to be at the bar in the next room over. For a moment, he worried. Had they somehow snuck past him? He knew he should have set up a second tripwire. Then the blaringly loud jukebox boomed across from the other main cantina. Nope. They definitely hadn't left. To confirm this, Gharzog carefully peered through the doors to see Ke'rii... Dancing? His daughter was there at the bar, eating something. Well, he certainly had some odd morning habits, but he wasn't trying to make a break for it so Gharzog made his way over to one of the couches nearby and took a seat where he could see through the doorway. The volume quieted down for a bit and Gharzog could just see Ke'rii fiddling with his cybernetics and talking though he couldn't hear the words. It was a pity that he couldn't lip-read either. After a moment, the volume was cranked up again. Which was a pity, because he preferred the quiet after living in the noisy atmosphere of Nal Hutta and Nar Shaddaa. Oh well. Assuming he could get that Quesh venom soon enough, and get it into Ke'rii's food or drink, this would be over soon enough. Then perhaps he could get a full night's sleep, and no loud music. Wheelie rolled through the lobby of the Dancer’s Palace and accessed the apartment Ke’rii and Keiko were staying in. He stopped when he realised the room was empty and let out a soft chirp before whirling around and leaving. He rolled back through the lobby, and carefully hobbled himself down the stairs in search of Ke’rii. Upon hearing the music in the bar, he rolled faster through dining hall, hobbled down the second set of stairs, rolled passed Gharzog in the game room and into the bar. He headed straight towards Ke’rii, who was still dancing on the dance floor. Wheelie let out a little chirp as the Imperial Captain noticed him and smiled. Suddenly, the astromech let out a loud, long beeeeeeeep! The song ended on the jukebox and Ke’rii stopped dancing. He stared at the droid wondering why he was beeping at him. “Beep. Beep. Beep. BEEEEEEEEP,” Wheelie chirped, his blue sensor looking straight at Ke’rii. Wheelie chirped a series of boops and beeps that sounded like ‘you’re welcome’, before he rolled off to do his other duties. Ke’rii watched the droid leave and made note of Mr. Hat seated in the other room as Wheelie rolled through the doors. His eyes drifted to Keiko, who was looking at him with the most unamused look he had ever seen on her face. He gave her a lopsided grin as he walked off the dance floor. “Why do I have a feeling this place is never this annoying this early?” Keiko said and yawned. “Not until you’re safe,” she wasn’t in a hurry to say goodbye to her dad. He hated making promises he couldn’t keep. He prided himself on his word, but he nodded his head and his jaw tensed slightly. He poured caf into a mug and avoided eye contact. His face tense, but his eyes softened in thought. He hated that this was happening, but hated more that it was affecting the ones he cared about. If he could just get out of this place and move freely without his new shadow right there, he could do something to get this taken care of. But who the kriff knew how long the hunter had been sitting in the other room. Waiting, probably listening. He wondered what the man would think if he knew he were trying to take these pirates out and skip him out of his chance for eight million credits--not that they’d ever pay him, but the poor schmuck didn’t know that. “How do you think our new friend takes his caf?” Ke finally looked up at Keiko. “What are you talking about?” good grief it was too early. How did her father do this? He smiled. “I always have plans,” he assured her before leaving the bar and stepping up to the automatic door to enter the game room. He leaned against the door frame and held the mug up to the hunter. Gharzog eyed the droid going past him with an interested eye. Ke'rii and his daughter seemed to trust it... Perhaps that'd be the best way to poison the captain, assuming that the thing did deliveries. Distract it and while it was looking elsewhere, slip in some quesh venom onto food or into a drink. It'd need to be timed just right but it was certainly a possibility to keep an eye out for in future. As the music died down, he could hear it's insistent beeping and shrilling through the door, before a few muffled voices engaged in conversation for a bit. He couldn't hear what was being said, just that there were two people involved, and judging by Ke'rii's moving lips, that he was one of the participants. Though he couldn't see her from where he was sitting, Keiko must be the other one chatting. Whatever was being said, Ke'rii's face was resolute looking. It must not have been a very happy conversation, but the voices never raised into a shout. Which was a pity, because then he probably could have heard what they were saying. After a while longer, the captain started to approach with a steaming cup of caf in one hand. As he did, Gharzog made certain that his rebreather and hat were in their usual obscuring positions. The bounty didn't seem to use his name so far, perhaps he didn't know it, and if that was the case; he'd prefer that he didn't find out. "Coffee?" Ke'rii offered, proffering the mug. He was a tad thirsty and his flask had gone empty by now, but he wasn't going to accept a drink from a bounty he was actively hunting. That was just plain foolishness, he knew it, and surely this... Entrepreneur-Imperial Officer-Whatever he was knew it too. Why offer it to him then, if surely he knew he would refuse? Judging by what he'd seen so far, probably to get a kick out of it. "I do believe I'd pass on 'yer caf, aye. Ain't exactly smart to take a drink from the bloke 'yer huntin', now is it? Could be all sorts of toxins 'ye got in there. And before 'ye even suggest it, I ain't going to trust it even if 'ye take a drink from it first, that kind of thing only works in the holo-novels." Gharzog returned dryly, looking the man up and down searchingly for weapons, both obvious or hidden. The security systems still worked, so far as he knew, but it never paid to drop one's guard for even a moment when in the company of someone that had every reason to try and shoot you. Ke'rii raised a brow ever so slightly as his hunter mentioned toxins. Was he a poisoner? He didn't seem the type but then again… they were both held up in an interesting place that didn't permit usual bounty hunter tactics. He merely shrugged and entered the room, deciding to sit on the window sill just a few steps from Mr. Hat. He wasn't armed. Nor was he even in armour. In fact, he was in plain and simple civilian wear; a black Czerka-logo long sleeve shirt, pants and boots. Not a single weapon of any kind visible, nor could one be hidden on him. The door to the bar, on the other side of the game room, slid open and Keiko walked out. She eyed the bounty hunter with a glare as she proceeded towards the dining room. Ke watched her as she crossed the room. His eyes tensed ever so slightly as his brain worked. He would prefer her to be out of here. This stalemate could only last for so long. He hoped it wouldn't be him that made the mistake, but it was clear, the hunter wasn't going anywhere. He studied the man as he spoke, looking for any revealing twitches. Looking for eye squints, sighs of irritation. How much patience did this man have? Gharzog continually kept a careful eye on the wily bounty despite his supposed lack of weapons. One didn't get a bounty of eight million credits for being harmless. Perhaps he was trained in some unarmed art. He'd heard tell of some martial use of limbs that left one adept enough to challenge even the hardiest individual, or even force-users. There was something that made this man dangerous and he'd prefer that he only find out what it was after the bounty was safely in his pockets. So he kept his coat splayed to the side so that he could have easy access to the two large-bore blasters sitting in his hip holsters; security systems or no security systems. As it is, he listened to Ke'rii in careful studious silence as he mentioned his brewing skills and his 'hospitality'. Perhaps he was just a hospitable carefree chum that wasn't trying to poison him with a cup of caf, but he didn't really care either way. He wasn't drinking it, period. Because no matter if this was really a lucky-go-happy businessman or a brutal killer, he got treated with the same suspicion as everyone else. Keiko's daughter entered the room and passed through, sending a lethal look his way in the form of a glare. Pity he had to go and make an enemy out of her; enemies always came back for revenge in the end, but he'd needed information and she was the best lead he had at the time. Who knows, perhaps antagonizing her had drawn her father Ke'rii to Coruscant. He'd never know. As Ke'rii started asking questions in a rapid spit-fire manner, Gharzog only chuckled. He was NOT answering any questions but just like the offered caf, this man surely should know that he wouldn't answer them. It baffled him as to just why he tried then to bother asking them in a rapid manner as though the pressure would make him answer. A mystery that he didn't really need to know the answer to. "Let me make somethin' clear 'ere. I don't ask questions. I don't answer questions, aye? 'Ye could be an innocent chap just livin' the high life, or a sadistic serial killer. But 'yer just a job. Ain't nothin' personal, but because of that, I ain't goin' to be 'yer buddy that shares 'is life story, get it?" After he'd finished, he leaned back against the couch, crossed his arms, and continued to watch him. He sipped his coffee again and watched his stubborn shadow, then downed the rest of his warm beverage and let out a satisfied sigh. He grinned and took off at an easy pace as he headed towards the dining hall. “Hope I found all your trip wires!” he called out, with a sort of sing-song amusement in his tone, as he disappeared through the doors. Gharzog growled unhappily to himself as he stood up upon his bounty vanishing through the dining hall doors. It was too damn early in the morning for this but, of course, Ke'rii wouldn't get to know that nor would he care. Gharzog was planning on passing him over to a bunch of bloodthirsty cannibals after all. That didn't exactly lend one a lot of regard in being an easy bounty to catch. As he followed behind Ke'rii at a brisk pace to ensure that he never left his sight however, he pondered on his would-be employers, the ones who would be paying the bill. The captain had mentioned that this Kenny fellow or whoever he was wouldn't pay, that these 'Crimson Dread Pirates' would cheap out and try to wiggle out of paying. It was always a possibility when one took a bounty. He'd already had it happen to him before on numerous occasions. There'd been that one time when Deemoa the Hutt had insisted that Gharzog was doing it for a favour and threatened to feed him to his rancor if he'd pushed the issue. Or that one underboss, Ulli, who'd tried to ambush him and do away with payment. Well, he'd gotten his credits out of both of them. He'd show three of Deemoa's enforcers and threatened to show him the business end of his flamethrower. Ulli, he had to kill, but he'd made off with a tidy fortune after selling her spice stash and jewelry. But what about these pirates? He'd never heard of them before this bounty, which was worrying, because it'd have to be a seriously heavy duty pirate clan that could dish out eight million credits, and heavy duty meant well known. His research into them hadn't turned up much; they didn't really leave much in the way of survivors. He'd heard something about cannibalism from them, but some of the Hutts he'd done business for in the past also had some... Unsavoury appetites and they'd paid up. Once, if, he got this bounty, he'd need to be careful about turning him in. Especially since pirates would like to meet on their own ships, as was their way. Not acceptable on his terms. He'd need to be firm with them. Maybe threaten to shoot Ke'rii dead if they didn't agree to his location. Then he could prepare it, set up some home ground advantages maybe. But that was getting ahead of himself, he needed the man in hand first. So he continued to follow close behind and to watch for his opening. Ke’rii was foolish to think he would be able to do his morning run in peace, but then he heard the brisk footsteps of his shadow. He glanced over his shoulder as he proceeded to run up the stairs. One. Two. Three. Four. He counted each step quietly in his head. If anything this would be a good judge of the guy’s endurance. And kriff, maybe even force him to reveal his face to him. Running with that rebreather had to be a pain. He made a mental note to account for the mask when calculating the hunter’s endurance. Despite the incline, Ke’s pace remained steady. He lead the other through the upstairs lobby, and back down the other stairwell. Another forty steps. He contemplated a nice jog outside on the balcony, but opted against it. He wasn’t as familiar with the security perimeter as his shadow was, and now was not the time to accidently step out of bounds. He made a mental note to ask someone about it. Perhaps Solange or Karmic… whomever he happened to see first. So he took the turn and entered the restaurant again, crossing through, up the stairs. His speed the same, his breathing steady. An incoming call on his cyberline broke his concentration, slowing his pace only a little as he tapped the upper blue button on his cybernetics before regaining his pace. “This Ke,” he said, his speech unaltered from his workout as he lead the way through the upper lobby again. He remained quiet as the caller spoke to him on the other end. He glanced casually at Mr. Hat to see how he was faring. “I expected you not to go back to Ord Mantell,” he lead them down the stairs again, then spoke softer, and with more care. “You okay?”............. He smiled. “Because I care, that’s why…” …………………….. He glanced over his shoulder again as he lead them through the restaurant again. “You were hot tempered too, and… had every right to be. I shouldn’t have--” Up the stairs again. His pace never faltering. “Of course we’re good--” ………….. He laughed. “You know me,” back through the lobby, and a glance back at Mr. Hat. “Look uh… now’s probably not the best time to have this discussion. Can I call you later?” ……………………… He laughed louder. “Nah, it’s all good. You know, just got a new buddy is all.” ………. “Relax, I’m fine,” he assured his caller as he lead them back down the stairs. “All right… Minmin larel valle,” <I love you> he said, speaking Olys Corellisi. He tapped the top blue button and ended the call. He remained silent as he lead the way once again through the restaurant, heading towards the stairs again. “How ya doin’ back there?” He called out. Ke’rii spotted his favorite dancing astromech. “Wheelie!” he shouted, running through the lobby. “Two bottles of water, if you please, my main astro-ooo!” he continued back down the stairs. He hoped he wasn’t killing his shadow.